Huntington Ingalls Industries, Inc. HII recently secured a contract for performing complex overhaul (RCOH) work on USS John C. Stennis (CVN 74). The work will be carried out under fiscal 2018 advance planning. Valued at $187.6 million, the contract was awarded by the Naval Sea Systems Command, Washington, D.C. Per the terms of the deal, the project involves first year of RCOH advance planning efforts, including material forecasting, long lead time material procurement, purchase order development, technical document and drawing development, scheduling, resource forecasting and planning. Moreover, the efforts include developing cost estimates for completing the work, data acquisition, pre-overhaul tests and inspections, and other technical studies as required to prepare and make ready for the CVN 74 RCOH accomplishment. Work related to the contract is expected to be over by July 2019. The fiscal 2017 and 2018 shipbuilding and conversion (Navy) funds will be utilized to partially finance the task. USS John C. Stennis (CVN 74) is a nuclear-powered aircraft carrier. Notably, it is the fifth of the ten total Nimitz-class aircraft carriers in service with the U.S. Navy. This aircraft’s living quarters can support more than 5,600 personnel, including a large portion made up of the air wing. Its air wing can accommodate 90 aircraft of various makes and types including helicopter. Additionally, the vessel offers a powerful air arm and limitless range, thus making it a prime operator in U.S. military global operations. Huntington Ingalls is one of the largest military shipbuilders in the country. Over 70% of the active Navy fleet consists of its ships. Notably, this military shipbuilder’s Newport News division is the nation’s sole designer, builder and refueler of nuclear-powered aircraft carriers. The company started off 2018 on a solid note with 25 ships under contract for construction at the end of the first quarter. In second-quarter 2018, the Newport News business segment registered an 18.3% revenue growth buoyed by higher revenues in naval nuclear support services and aircraft carriers. Considering the latest contract win, we may expect this business unit to generate similar solid revenue growth in coming quarters as well. Furthermore, we expect the company’s overall growth momentum in maritime security to continue in the days ahead, considering the recently approved fiscal 2019 budget by the U.S. Senate. Meanwhile, the shipbuilding business outlook also remains strong, in light of the 29 National Defense Authorization Conference Agreement that President Trump has signed this July. Markedly, this bill authorizes the purchase of four forward class aircraft carriers CVN81. It also supports the purchase of CVN 80 and 81 under single contract, as well as advance procurement for LPD Flight II amphibious warships to leverage high production lines and supply chains. Surely, once the U.S. Navy acts upon such optimistic bills and budgetary amendments, we may expect shares of prime U.S. military shipbuilders like Huntington Ingalls to gain substantially. 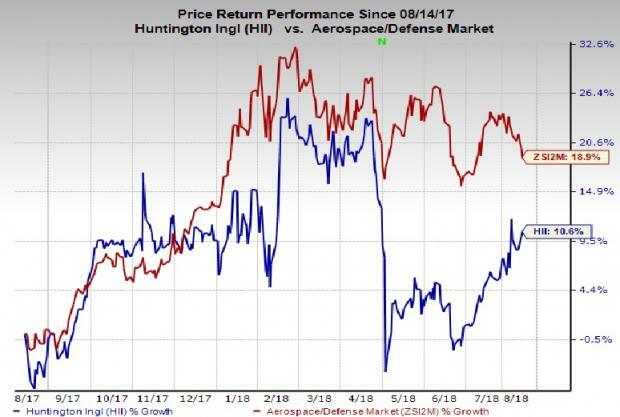 In a year’s time, shares of Huntington Ingalls have rallied 10.6%, underperforming the industry’s 18.9% growth. This dismal performance could be because of the huge amount of debt loads that the company bears, which in turn increases its vulnerability to adverse economic or industry conditions. Huntington Ingalls currently carries a Zacks Rank #2 (Buy). A few similar top-ranked stocks in the same space include Lockheed Martin LMT, Engility Holdings EGL and Textron TXT, each carrying a Zacks Rank of 2. You can see the complete list of today’s Zacks #1 Rank (Strong Buy) stocks here. Lockheed Martin surpassed the Zacks Consensus Estimate in three of the trailing four quarter, with an average beat of 9.10%. It has a long-term earnings growth rate of 7.30%. Engility outpaced the Zacks Consensus Estimate in the trailing four quarter, with an average beat of 19%. It has a long-term earnings growth rate of 5%. Textron exceeded the Zacks Consensus Estimate in three of the trailing four quarter, with an average beat of 20.44%. It has a long-term earnings growth rate of 11.40%.